So, at long last, the motherlode of Devon Record Club; the artist we’ve spoken about more than any other. Before recording Ege Bamyasi in 1972, Can scored an unlikely pop hit in the German charts with Spoon, which sold some 300,000 copies due to being the theme tune to a television program. They used the earnings from Spoon to buy an old cinema, which they both lived and recorded in for the next few years; prior to that they’d recorded in a castle, because the owner of the castle thought they were great, or something. Recording Ege Bamyasi was fractious – two of the band obsessively played chess during the sessions (if you can call them sessions), driving the rest of the band to distraction, and a shortfall of finished material meant they superglued Spoon to the end of the album in order to flesh it out to 40 minutes and seven tracks in length. 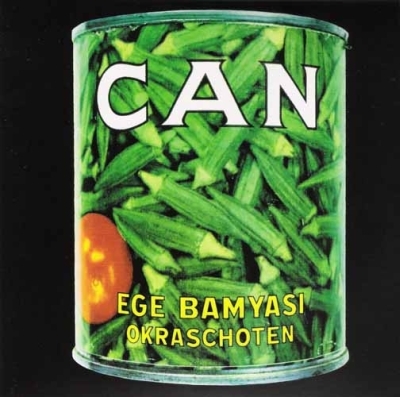 Ege Bamyasi is my favourite Can album, I think, possibly because it’s the first one I got, some 15 years ago as a wide-eyed 18-year old, and possibly because it’s also the most fun. I played it at a party once, years ago, and everyone else complained that it was weird. It’s Can’s poppiest album, even though it sounds like aliens hearing the entirety of 20th century music at once and mashing it all together to make their own music, which contains everything (German youth post WWII desperate to split from their country’s past and create something absolutely new). So you end up with something that borrows from jazz, from rock, from the beginnings of electronic music, from Vietnamese music and various other musics from across the globe, long before World Music became a section in HMV. There’s guitar as wild as anything Hendrix committed to tape, synths and electronics as innovative as anything you’ve ever heard, Damo Suzuki’s unrivalled, inscrutable vocals in any number of made-up tongues, and always, always, Jaki Leibzeit’s incredible, pulsating drumming, repeat repeat repeating into delirium, making you twitch and jerk and spasm with little, replicating jolts of percussive joy. Pinch, the alum’s ten-minute opener, is a shuttling roll of drums and electronic squeaks, the first thing I’d ever heard by Can, and the summation of everything I’d imagined they would sound like after reading about them. I’m So Green is a liquid funk thing that got nicked by The Stone Roses. Sing Swan Song is a bona fide, blissful pop song, delicate and beautiful and oh so very strange. After 15 years I still find new things every time I listen. Tom Listened: You have to hand it to Can, they certainly knew how to open an album! All the Can albums I own (the four biggies of the early seventies) kick off with an amazing song – Tago Mago has Paperhouse, Soon…the wonderful and, possibly, underrated Dizzy Dizzy, Future Days begins with Future Days and then there’s Ege and its opener, the remarkable, mind blowing swirl of squonk that is Pinch (squonk is a technical term for the sound that Can make on Pinch). It was my first encounter with the band and I can still remember being incredulous that the sound coming out of the speakers could be being made by (a) humans and (b) humans of the 1973 variety. Although Pinch is undeniably incredible, there are many other outstanding moments on Ege Bamyasi and it feels disloyal to single one or two out and tedious to run through the lot. I suppose it’s easier to say that the last 5 minutes of Soup – it’s a free-form freak out (to use a phrase coined by the Red Crayola) – is the only part of this amazing album that is less than outstanding and ironically (given that I’m sure the band thought this would be, like, totally cutting edge at the time), it sounds far more dated today than any of the more conventional soundscapes that the band conjured up on the rest of the album! So to sum up: a must have album from a band that gets talked about a lot at DRC (but not as much as Talk Talk). Rob listened: It’s not the motherlode, it’s just another record. I was both relieved and I guess disappointed that Nick, who seems intent on bring as much of the canon as he can haul to our meetings, dragged along the only Can album I know. I rarely ever go back and listen to it, but when I do it’s always a pleasure and tonight was no exception. Amazing to think they were putting this stuff together when they were, and delightful to try to trace the lines of influence down through the years. I was disappointed not to have ‘This Nation’s Saving Grace’ in my glove box so I could play Tom and Nick ‘I Am Damo Suzuki’. It’s just the two of them who have spoken about Can more than any other artist, but I’m sure they would have enjoyed MES’s gag-filled yet genuine tribute. Maybe next time. Graham listened: First listen for me left me very confused. Nick has in one fell swoop managed to wipe out a significant portion of my musical reference points. No one told me bands were alowed to sound like this in 1972! Some parallels to the first time I heard Spirit of Eden (which is in no way a a crude attempt to get Talk Talk back to the top of the most talked about band charts, oh no…).